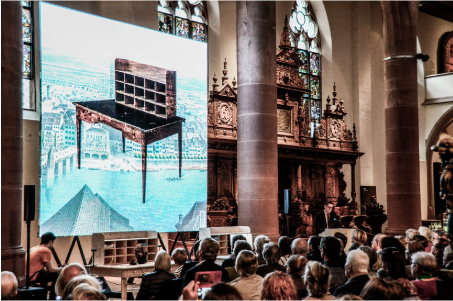 As part of a celebration of Jacob Burckhardt’s 200th birthday, we were honored to interpret a new version of the desk upon which he carried out part of his life’s work. In 1850, Burckhardt commissioned an austere desk with a simple Biedermeier shape, two drawers, an oil-cloth top, and fifteen compartments at the back. 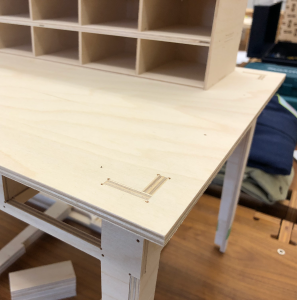 In 2018, we developed Tisch Burckhardt is a downloadable, entirely CNC cut version. A Swiss historian of art and culture, Jacob Burckhardt is best known for writingThe Civilization of the Renaissance published in 1860. Burckhardt profoundly influenced historiography by showing how to consider a topic in it’s entirety, insisting that to understand Renaissance painting, one must concurrently study the music, sculpture, architecture and daily life of the period as well. By some he’s referred to as the father of cultural history, and he’s featured on the Swiss thousand franc banknote. 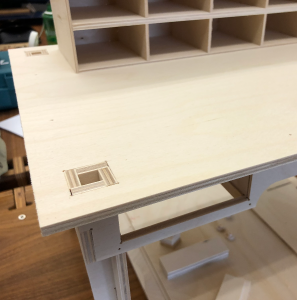 Technically, our version of Tisch Burckhardt gave us an opportunity to consider furniture construction assemblies and sliding joinery. 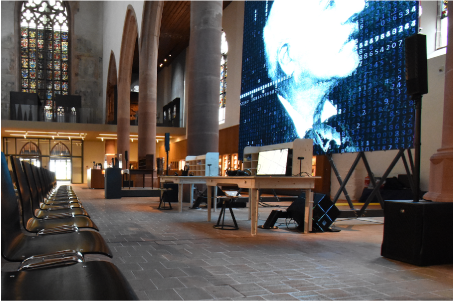 In the largest sense, it provided a chance to reflect on the work of Jacob Burckhardt, and to consider how our tools shape our thinking, and to explore a way of engaging history both digitally and virtually. 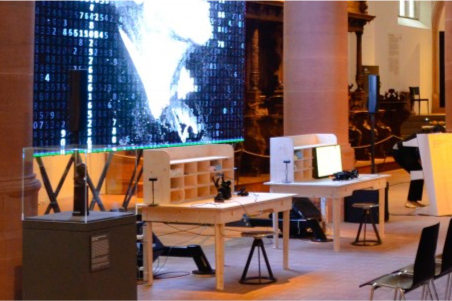 Despite it’s simplicity, translation from the 1850’s hand-crafted version of Tisch Burckhardt into a digital iteration posed some challenges. 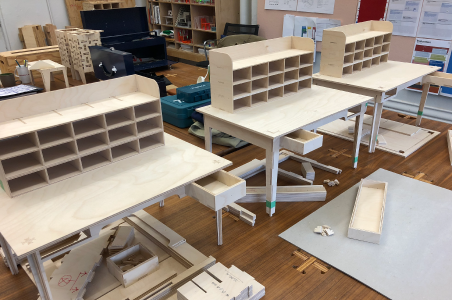 Chief among them was ensuring the same structural stability of the original, solid wood parts fabricated by a woodworker, with flat parts cut by a CNC router from sheet stock. 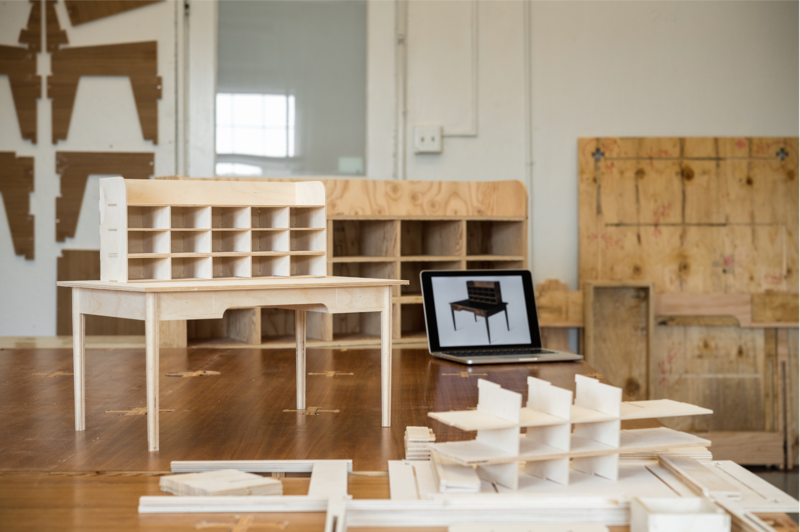 The original desk possesses extremely delicate square section legs, with an elegant taper from top to bottom. 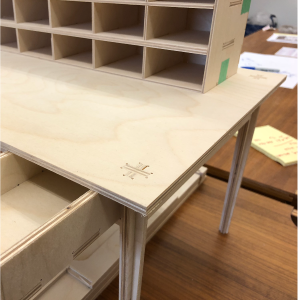 Coupled with the weight of the compartments at the top, and the moment created by fully extending deep drawers, the structural achievement of the slim legs is not insignificant. 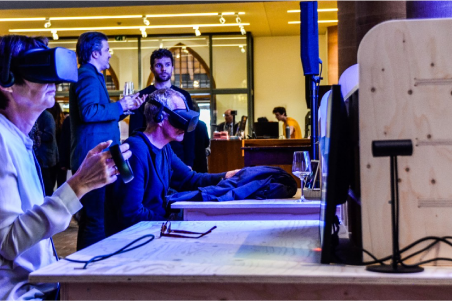 The challenge is how to replicate, or translate the elegance of the original into a contemporary version made with entirely new tools and material? We tested three different leg-assembly versions before arriving at the best solution. The first involved a slotted connection, resulting in a cruciform leg with a taper to match the original. When the tapered cruciform matched the original leg, it proved unstable. Widening the taper enough to achieve stability resulted in a heavy, squat profile that no longer had any relationship to the original desk leg. 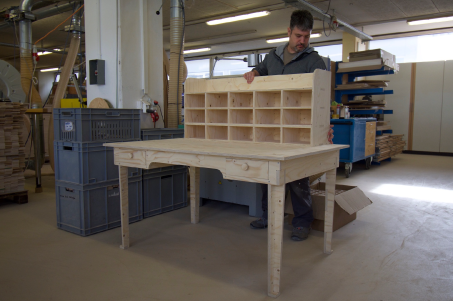 We moved onto a second version of the desk with a joint at the outer edge of the leg. This adjustment provided a stable base with a taper to the inside of the leg, but the vertical line to the outside of the leg made for a heavy stance, not at all as elegant as the original. 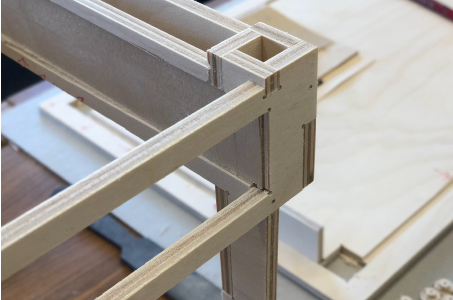 For the third and final version, we placed a vertical joint at the inside of each leg, allowing for a taper from the outside on every elevation. While minimal, the taper provides a lightness by ever-so-slightly diminishing the profile of the table from top to floor. The difference from one version to the next is an essay in the importance of the most subtle details in design. 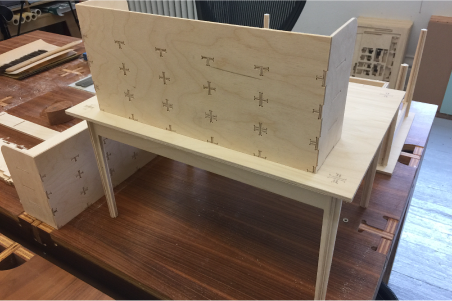 We created an assembly at the corner of the table top, using a through-connection that connected all parts that form the leg, front and side of the desk into a ‘hole’ where each tab nests with those adjacent in a rotational manner, marking the distance and closeness of the CNC milled version to the original.